Write protection (read-only) on a disk prevents the contents on the disk from being changed. There are many reasons for how a disk is write protected. This tutorial will show you different ways to enable or disable write protection for a hard drive, memory card, or USB drive for all users in Windows 7, Windows 8, and Windows 10. You must be signed in as an administrator to be able to do the options below. You will not be able to write protect the Windows drive. This is the usual error message a user will get when trying to format or write (ex: copy) something to a write-protected disk. This is an error message a user will get when trying to create a new folder on a write protected disk in Windows 10. Some USB flash drives and memory cards have a physical switch that allows you to lock or unlock write-protection for it. 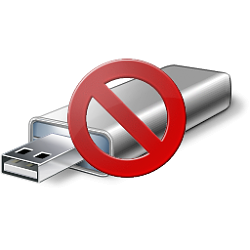 The location of a switch (if available) on a USB flash drive will vary. If locked, this will override any other option below, and the device will be write protected on all PCs you connect it to until unlocked. 1. Examine the USB flash drive or memory card for a switch like below. If available, you can move the switch to the locked or unlocked position to enable or disable write protection for the device. This option is only applied when removable disks are connected to the PC that the policy is set on. 3. In the elevated command prompt, type list disk, and press Enter. Make note of the disk # (ex: disk 1) for the disk you want to enable or disable write protection for. 4. In the elevated command prompt, type the command below, and press Enter. Substitute # in the command above with the actual disk # from step 3. 5. Do step 6 (enable) or step 7 (disable) below for what you would like to do. A) In the elevated command prompt, copy and paste the command below, press Enter, and go to step 8 below. 8. When successfully finished, you can close the elevated command prompt if you like. Very nice addition to the Tutorials David and Shawn! I followed this procedure with my windows 10 installation usb. Disk part claimed success but I still cannot format it. To clarify I wish to format it so I can install the latest version of windows on the usb using the media creation tool, so I don't have to install so many updates if I ever have to reinstall windows again. If what I am attempting to do is simply not possible, by all means let me know. Are you getting any error messages when you try? Is this a USB from a retail box of Windows 10, or a USB that you have previously formatted to make a Windows 10 installation USB on? If so, then it may be permanently locked to prevent tampering with. If this is not a USB from a retail box of Windows 10, then you might see if running a "clean" command on the USB to make it unallocated to allow you to use afterwards. It is indeed a retail box version, I've tried the clean function using diskpart and it gave me an error. No go on this one I guess. You could try to do a clean command on the USB, but I believe it's hardware locked to not be able to modify it. If you have another USB flash drive, you could use it. They're cheap these days.